The Christmas Emporium collection by Graphic 45 has really inspired me to create! 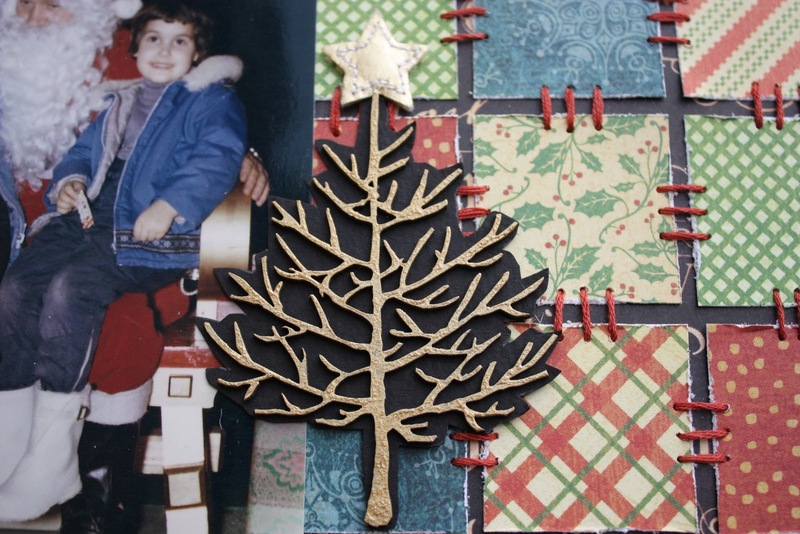 I haven’t scrapped many photos from my childhood and knew it was time to use this precious pic of my brother and I on Santa’s knee when I saw the gorgeous G45 papers. I dearly love this photo…it captures that innocence of the Christmas season, the belief in Santa Claus and all the magic of waking up Christmas morning to find presents under the tree. I remember that blue jacket and fuzzy white hood trim, and especially those white galoshes. Do those kind of winter boots exist anymore? You know the ones…you wear your shoes INSIDE of them! And there is a rubber buckle at the top to tighten? Ahhhhh…memories of simpler times…. But I want to make clear that I am NOT labelling this design as a heritage page or vintage layout…ha ha! I’m not that old, am I?? 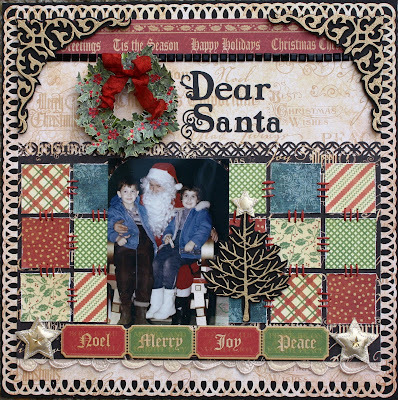 The edges are punched by Martha Stewart, the cream ribbon running along the bottom is Harmonie, the fabric stars are KI Memories, the sticker alpha is Fancy Pants, the chipboard scroll corners and tree are Dusty Attic, and the chipboard ticket border is Graphic 45. 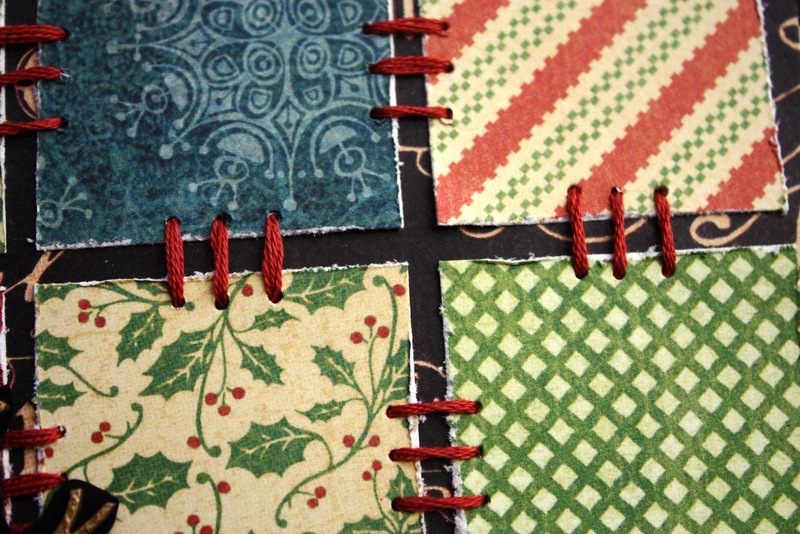 I created a quilted background by stitching squares of patterned paper. This Dusty Attic tree is painted with Gold Metallic Adirondack paint and backed onto black Bazzill cardstock. I “pounced” the gold paint dabber onto the chipboard to give it a more metallic appearance. This scroll corner is also backed onto black Bazzill cardstock. The square bling is Recollections (from Michaels). 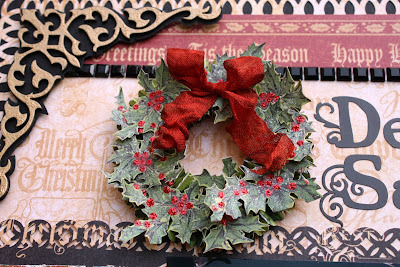 The base of the wreath is made from 2 Tim Holtz medium rosette strips (Sizzix die). The holly leaves are fussy cut from the Graphic 45 patterned paper and covered with Ranger Clear Rock Candy Distress Stickles. After they were dry, I layered them onto the rosette wreath base, using Fabri-Tac as my adhesive (fast-drying liquid glue)…..an essential for me! To finish off, I added Stickles in “Xmas Red” to the holly berries and a red bow. I coloured white seam binding ribbon with Fired Brick Distress Stain, crumpled and let dry. Here is a closer look…. The leaves curl as the Rock Candy Stickles dries. Wishing you all a joyous Christmas and wonderful holiday season! You’re adorable. 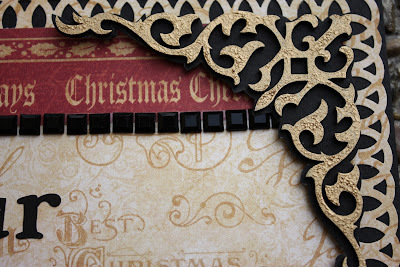 Love the page, the stitchery, the metallic accents on the chipboard, the border. Merry Christmas Kelly! Kelly, this is stunning! I saw your layout in Canadian Scrapbooker…your so talented. I love all the work you put into your designs. The wreath is fabulous! Really great LO! I love all the detailing! The chipboard turned out so nice and the wreath is very creative! I had a pair of those boots too but they were a yucky brown colour and so I couldn’t wait to get rid of them. Another lovely layout filled with great techiques. a perfect Christmas layout!!!! love the photo too! You are way too young to be “Vintage” girl. Such sweet photos and I adore that wreath. Merry Christmas to you! 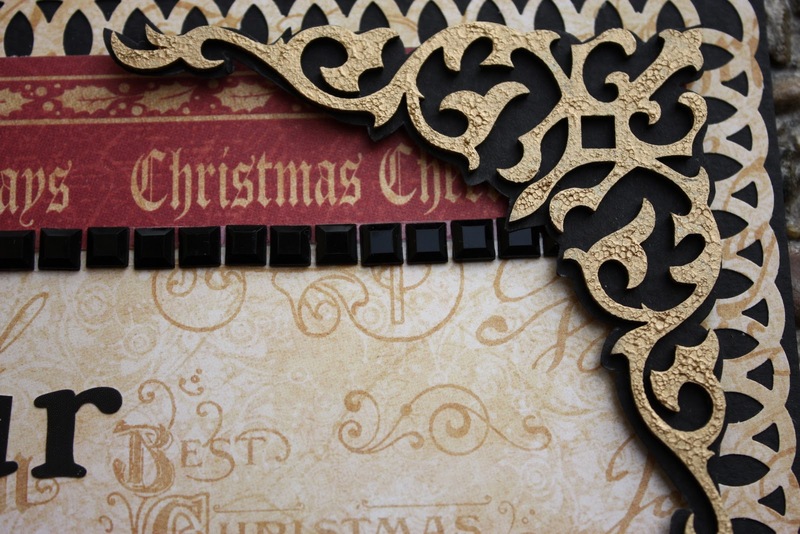 love the quilted background! wonderful x-mas page!! wishing you and your family a very merry x-mas and all the best for 2012! Gorgeous and amazing. I love the way you worked these papers. 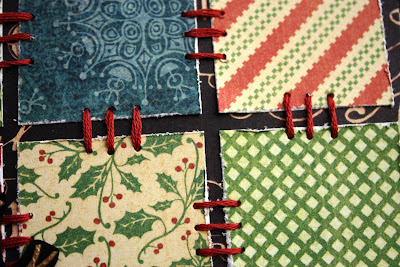 The stitching looks so great and that non-heritage photo is FAB! Another awesome page! 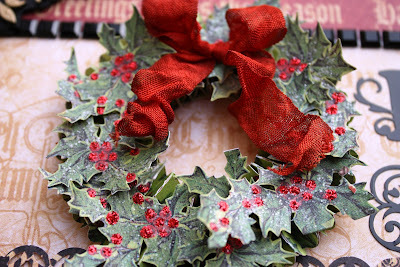 Love the stitching and that wreath is too cute! Very pretty layout. Hope you had a Merry Christmas. I had a pair of those white golashes…what a great layout of great memory. Oh Kelly I love this! I just got this paper collection, it was one of my gifts we found wrapped under the tree but could never determine who it came from??hehehe,wink,wink?? I hope that you had a wonderful holiday season with your family and I look forward to what you will bring to us in 2012! a lovely recollection of Christmas past.